Do you like to run but still find it challenging to go out and get your run in on your own? 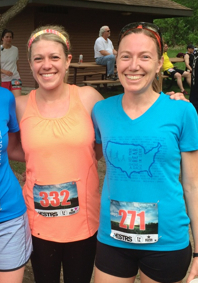 If you join our group, you just might find yourself looking forward to your run! When you run with the CBRC, it’s also your time to wind down from work, school, or whatever, and enjoy the company of friends. As a bonus, running with a group will almost always increase your pace over running by yourself. 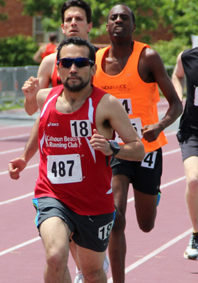 Our coaches have designed a marathon program to optimize club members’ talents and give them the greatest chance to run to the best of their abilities on race day. This program is designed for runners who want to improve their speed and endurance. However, we recognize that not everyone is training for a race or that some people don’t have the time to commit to a multi-week training program. The training program we use can be modified to account for runners who have less time or are new to running. See below for a sample training week schedule from last spring Grandma's and Boston Marathon plans. Please note that all runners have the option to do less than the group workout on any given day. The mileage below reflects the average workout week for the experienced runner. Beginners in the group will tend to run less mileage, and there are always route cut-offs available for runners looking for less distance. If you are planning to train for a marathon you do not have to start marathon training on the date we do. Join us anytime. We do recommend, however, that you consider joining us immediately so you can develop your base. Grandma's marathoners have a 4-7 miles easy run to continue recovering from Saturday’s 25k race. Boston runners will do a 20-25 minute tempo run and should consider doing a total of 7-9 miles. All runners warm up together to Lake Harriet (2 miles) where Boston runners will begin their workout. Those not running a marathon should plan to do between 3 and 7 miles. Good chance for runners to get an extra run in, especially if they miss one this week. Runners should otherwise consider cross-training on their own. Good day for non-Boston runners to add in strength training. 7 miles easy for Grandma’s, 5 miles with some speedy pick-ups for Bostoners. Shorter routes are available for others joining us. Happy hour in Uptown after the run. 12-15 miles for Grandma’s. Route is the Calhoun, Harriet to the Minnehaha Parkway. 12 miles is turning around at the Bunny statue at Portland. 15 is the community center at Nokomis. Boston runners have 17-19 miles. Same start as Boston, but keep going past Nokomis to W. River Parkway and come home on the Greenway. Optional loop of Nokomis to get to 19. There will be a support stop for those going at least 15 miles at the Nokomis Community center. 3-4 miles or cross-train. Strength training optional but recommended.